If I could, I'd take you all to Dallas right now to eat brunch at one of our favorite places, Bread Winners. From what I understand, they've opened a few locations since we lived there, but we'd go to the original location on McKinney. It's quaint and hip and cool, without being pretentious...multi-level with a gorgeous, plant-filled, open-air atrium (where I never sit because I don't want my hair to frizz). Here's what we'd order: Banana bread French toast and mimosas. Mr. E always gets some sort of egg dish, but me....I just can't get past that French toast. Inspired by Bread Winners, I made Banana Bread French Toast at home. Like theirs, I piled mine high with clouds of whipped cream (I sweetened mine with brown sugar)...but for the syrup, I made up a little peanut butter maple syrup. First, you'll need banana bread. 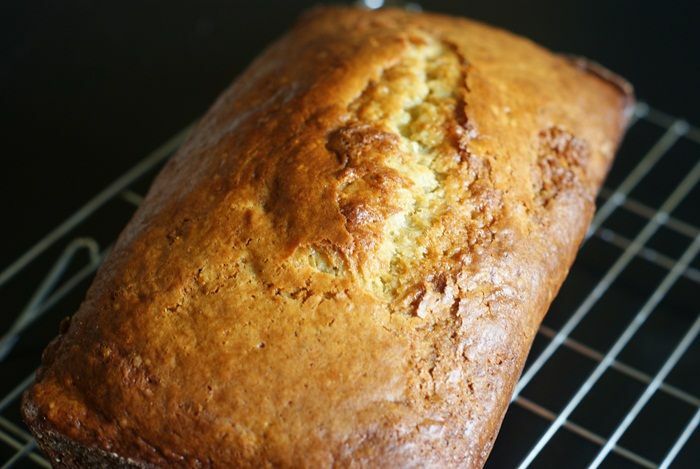 If you have a banana bread you love, by all means use it. I'll provide one for you below. You'll want to bake the bread and let it it COOL COMPLETELY before making the French toast...the warm bread may fall apart on you. Grease a flour a 9 x 5" loaf pan. Set aside. Preheat oven to 350. Whisk together the flour, baking soda, baking powder, salt and nutmeg. Set aside. 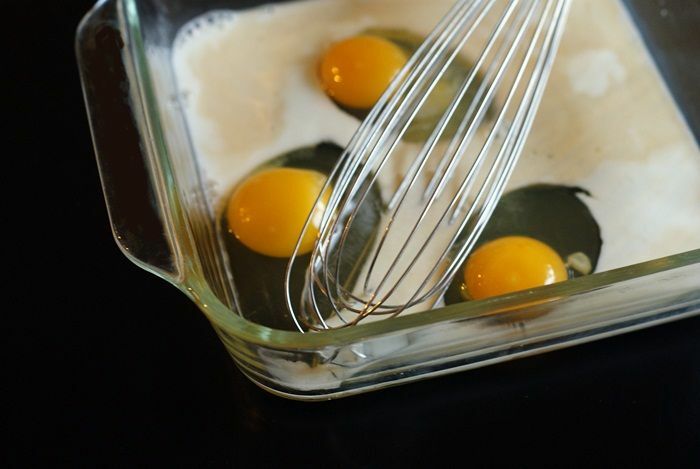 In a large bowl, beat the eggs, sugar, and oil until well combined. Add in the bananas and vanilla bean paste and mix. Add in the flour mixture on low speed, just until combined. Stir in the yogurt and milk. Pour the batter into the prepared pan. Bake for about 1 hour, or until a toothpick inserted in the center comes out clean. If the bread is browning too quickly, tent with foil. Let cool in the pan for 10 minutes, then remove from pan and place on a wire rack to cool completely. Whisk the maple syrup and peanut butter together in a small saucepan. Keep over low heat, whisking occasionally. Add the brown sugar to the bowl, breaking it up with your fingers. Add the cream. With the whisk attachment, whip the cream with the sugar until peaks form. Set aside. Heat a griddle or pan. Whisk together all of the ingredients, except the butter, in a shallow dish. 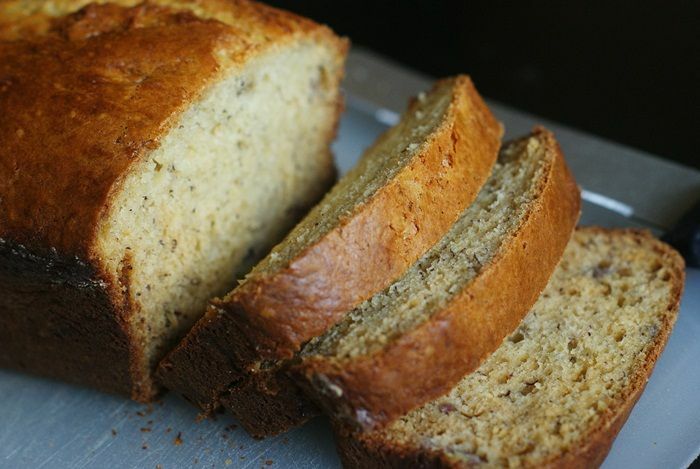 Slice the banana bread into thick slices. Dip both sides of the bread in the egg mixture. Butter the hot griddle, and cook the bread on both sides, until golden. Place 2 slices of bread on each plate. Add sliced bananas, if desired. Drizzle with the syrup. Add massive dollops of brown sugar whipped cream. Oh my! This looks fantastic! I have never thought of making french toast with anything other then normal bread (adventurous i know!) aaaand peanut butter syrup! You have created a monster Bridget! Yum! I actually live in Texas, moved for OH in June. We have been to bread winners many times but never ordered this. Will do next time.. Thanks so much for the recipe!! "Do you love that "crack" in the top of bread like I do" <-- yes and I pick around it and pick at it. The crack is my crack. I love that part of the bread! Just like I love crumble topping and brown sugar whipped cream. And PB Maple. Omg. Bridget! There are like 10 amazing things in one in this recipe! I drool. This looks delicious! I want to drop everything and make this right now! My life has been missing banana bread french toast! This looks like serious breakfast heaven... peanut butter maple syrup omg! Oh my! My mouth is watering just looking at this! I need to make this, might even try it with pumpkin bread too! Wow, this looks amazing !!! Thanks for sharing. This might be the perfect breakfast! And I'm with you on the potential hair frizz...humidity does not make me cute. May I please come to your house for breakfast? This looks insanely like the perfect breakfast combination. Oh yeah, and I'm totally with you on the bread crack. It's the best thing evah! My grand-kids love my French Toast. They also love my banana bread. 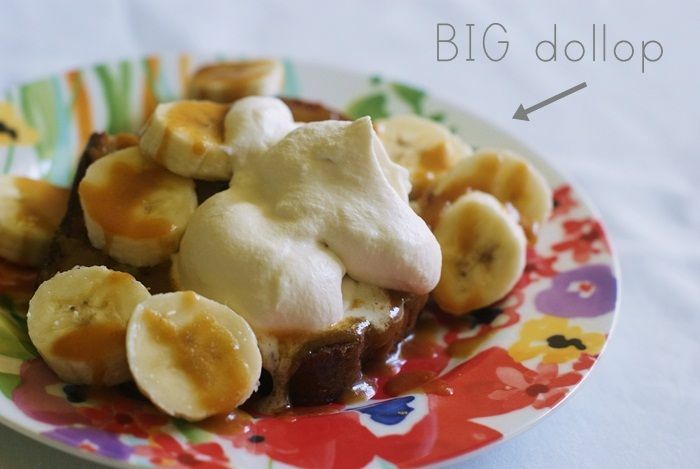 Until this post I've never thought of making them banana bread French Toast. I don't think they'd ever want to leave if I started making them this, so guess what's for breakfast the next time they come to visit?! I like the texture of the loaf. This makes yummy breakfast. Holy cow, this looks amazing. This is seriously too good to be true. And I agree -- avoid the atrium at all costs!! Frizz makes me stabby. O.M.G. That's a beautiful thing! Ive made banana bread french toast before and it is AMAZING! But you put it over the top with all of your amazing topping! 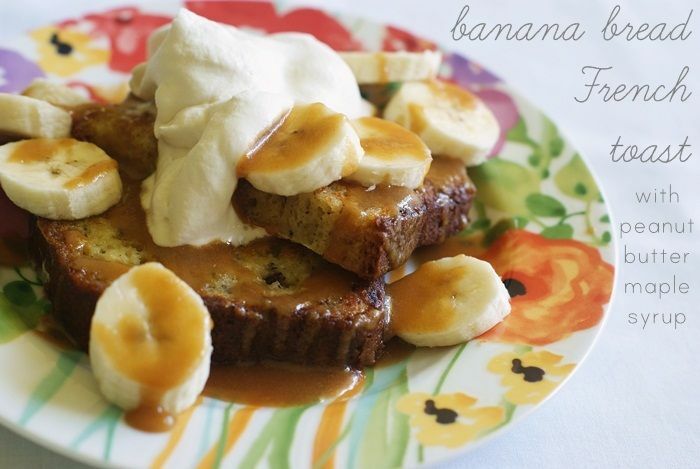 Banana bread french toast is soooo perfectly decadent! Yum. Beyond brilliant. I adore this idea! Wow! I can't wait to make this for my hubby and kids! It looks sooo yummy. Thanks for sharing! We are so flattered by your article and are thrilled that we inspired this post! Thanks for making our day!! We will share your link on our Facebook/Twitter channels to help promote the post. Keep up the great work! Oh, my gosh, what a treat! If I wear sweat pants I won't have to do any unbuttoning of the pants. These are some of my favorite flavors, all on one plate! Wow, this looks absolutely delicious!! I know what I'll be making for breakfast next weekend--if I can wait until then....or maybe we'll be having breakfast for dinner one night this week! You inspire me to try and make beautiful cookies. I hope to give it a try soon. I am not known for having lots of patience but I would love to make beautiful cookies. Congratulations on your book, I will be grabbing myself a copy. looks delish! Thanks for posting. Sakes alive Bridget! Good thing there's not one of those restaurants around these parts. I'd totally be sporting the elder Elvis look fer sure. I am still trying to wrap my head around this amazing looking breakfast treat! I am so amazed that I have never once considered doing this! It looks heavenly! I will WITHOUT A DOUBT, be making some french toast out of my next loaf of banana bread!! YUM! 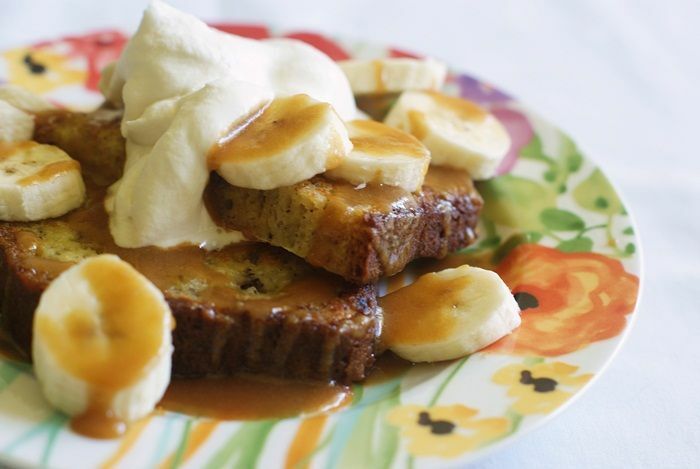 Banana Bread French Toast?! OH MY G! And that topping...I think this is heaven. I need to visit Dallas. oh my word, I think that would be worth the drive from Canada to try. I love making second-day banana bread into French toast--I didn't realize it was a thing, haha. And I LOVE your version with the caramel and that huge ol' dollop of whipped cream. Holy yum. 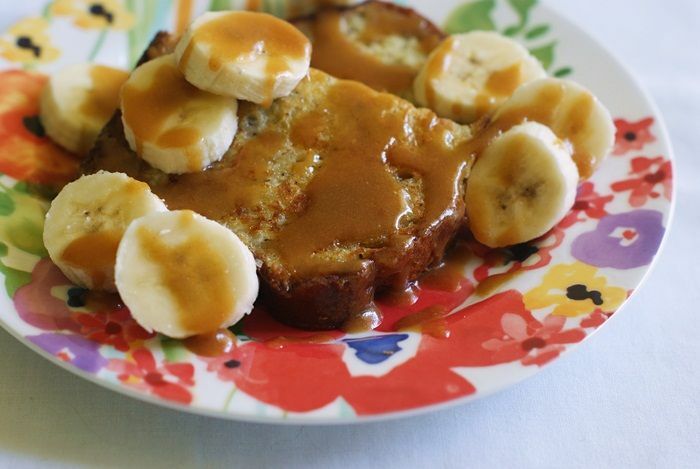 I've totally done this before- the banana bread french toast thing... but that peanut butter syrup takes it to a whole new level!! Oh my! I must try this! Yum, this french toast looks amazing! Can't wait to try it. Holy cow, I don't even know where to start! Brown sugar whipped cream?! Every part of this dish looks amazing! Oh good gosh. Looks like I'm going to have to buy a bigger pair of fat-pants this winter! This looks amazing. Greg would LOVE LOVE LOVE this! Do you know what he would do if I made this for him one Saturday morning??? And it's healthy with all the banana slices. And peanut butter is healthy too~right! That's the prettiest banana bread I've ever seen! Love it all and I know Kiddo and Mr. E did! Make this for me when I come spend the night~okay? And how HILARIOUS are you not sitting in the open-air atrium to prevent the FRIZZIES! Yummy... it looks stunning! I will try this good looking recipe, after I will get my maple syrup. I've ordered it from here: http://www.canadathestore.com/products/pure-canadian-maple-syrup-1l and I can't wait to see how it will be... hopefully tasty, because I don't know the brand. However, I will be back with my opinion... a really good one for sure and keep up the good work with the blog... I LOVE IT! !